Baked potatoes are so simple, so tasty, so perfect to accompany other foods. However, they are also super when they're loaded with other things. I'm sure there are enough confusing varieties of potatoes out there, but let me confuse you some more. I grew up in a little town in northern Nevada that is well-known for their potatoes. 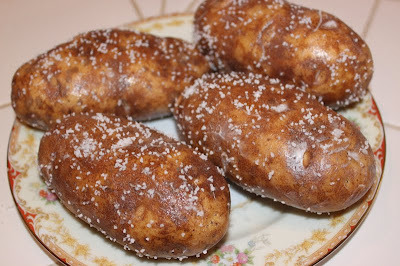 Winnemucca potatoes. They are Russet potatoes, but someting about the terroir, the dirt, the environmental conditions makes these extra tasty. I think they are slightly fluffier than Idaho Russet potatoes. And of course, since I grew up in the oh-so-glamorous WMCA, I have to prefer my local spuds. I have even taken some green sprouting spuds and planted them at home and grown my own. Damn, I had some good potatoes. I know they weren't really Winnemucca potatoes then since I grew them in Sparks. They were miles better than most grocery store spuds. 1. Wash, scrub, rinse, and dry the potatoes. Make sure to dry them well. 2. Using about 1/2 tablespoon of butter, rub all over the exterior of one potato. Generously sprinkle all over with kosher salt. Cut a small slit or poke with a fork on one side for venting. Repeat for other potatoes. Do not cover or wrap them. 3. 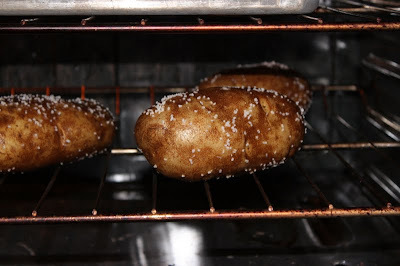 Bake in a preheated oven. Baking times will vary depending on the size of the potato and the oven temperature. If you have a roast in the oven at 325-350F, the spuds will need to cook about 1 hour 15 minutes or even an hour and a half. If they are cooking alone, go for 375-400F so they will take about an hour. 4. Be sure to squeeze them with a pot holder or mitts to test if they are done. If the potato easily yields when you squeeze, they are done. The skin should be nice and crispy, with the inside very tender. 5. Serve with butter and sour cream as a side. 6. 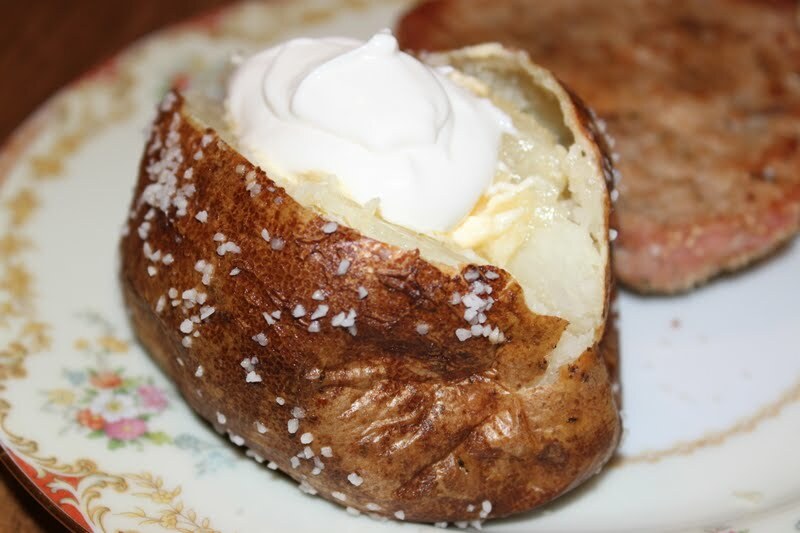 If you want to make yours into a stuffed potato meal, slice open the top, squeeze the spud to loosen the insides, fluff with a fork, and top with other things. Cheese, crumbled bacon, cooked broccoli, sauteed onions, chili, or something with gravy like chicken a la king, are great on a baked potato.